Last week I got together with Prof. Justin Fermann of the University of Massachusetts Amherst chemistry department, a great enthusiast for craft and obviously a learned chemist. For all his technical knowledge, none of the magic is lost on him, and he actively pursues blacksmithing, glassblowing, pottery, and brewing, fully content with neither the science nor the practice. 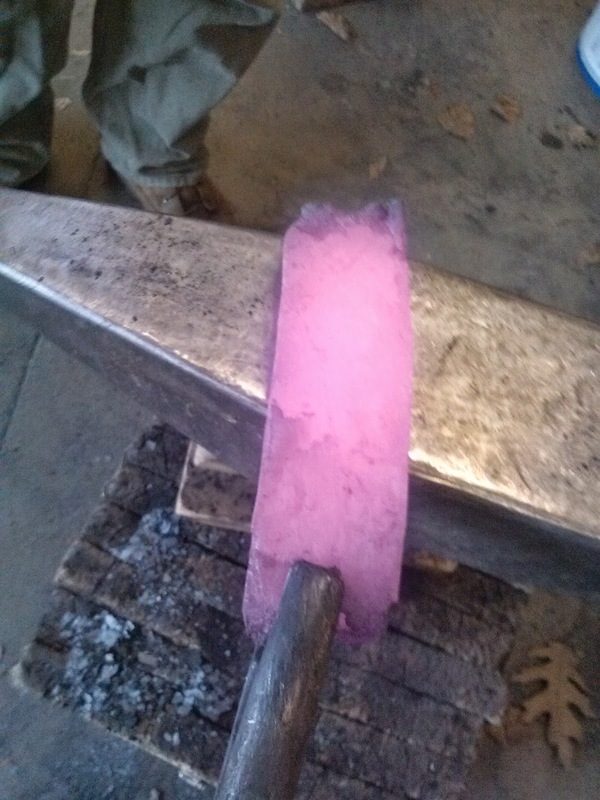 What we met to do was to take the hearth-melted material that I made with Jack McAuliffe, in many ways indistinguishable from ancient, home-made bloomery (iron smelted directly from iron ore), and compact its porous, spongy mass into a bar without seams or cracks that would compromise its usability in a blade. In order to squish all the holes shut and seal up the cracks, we had to first flatten all the little pieces we had at a yellow-white welding heat, in order to squeeze out the slag leftover from the charcoal furnace and fuse the voids shut. This necessitated a very hot fire, so we burned charcoal in a coal forge and used a hand-crank blower. Charcoal burns extremely hot and fast, and we hoped it would also lend some of its carbon to the steel's molecular matrix to help ease of welding and to give us a more hardenable product. Slowly, we flattened all the pieces and then stacked them on top of each other. At first, we had a very frustrating time welding each piece to the other. Justin would crank the blower and when we deemed it hot enough to weld, he would grab the pieces with two pairs of tongs and lay the hot ends on top of each other. I would tap that end lightly with a smaller hammer in order to tack the weld. After the end was tacked, on the next heat I would fully set the weld with a sledgehammer. We worked from one end to the other, welding, scraping, fluxing, heating, welding. We first fused two pieces, then began to add. We had four small pucks of the hearth material Jack and I had made. I had several similarly flattened cakes of Jeff Pringle's bloomery material about equal in mass, so we added those too. We layered them all together, and once all of our flat pancakes were welded into a solid stack, I turned them into a bar shape on the power hammer. 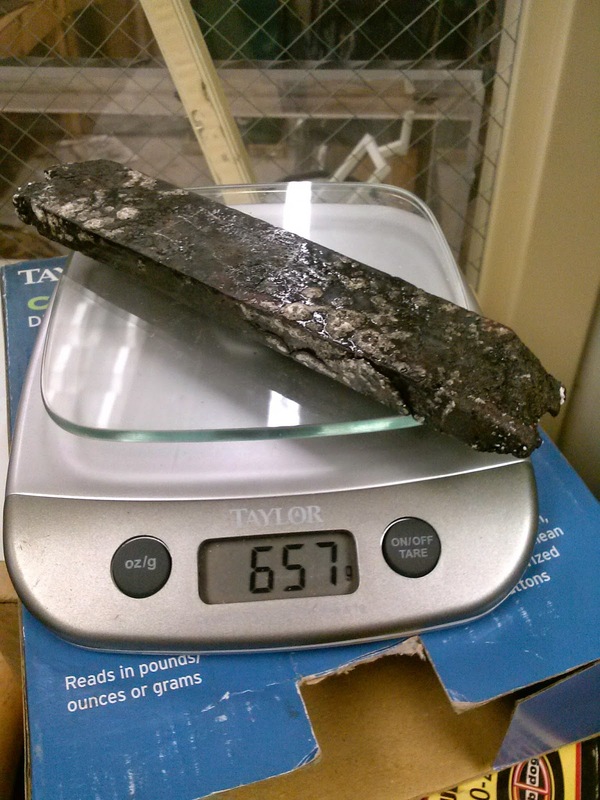 The consolidated but unrefined bar cooled down and weighed in at 657 grams. Completely covered with charcoal dust and little burns but elated with our learning curve and general level of success, Justin and I slurped down a bunch of water and called it a day. 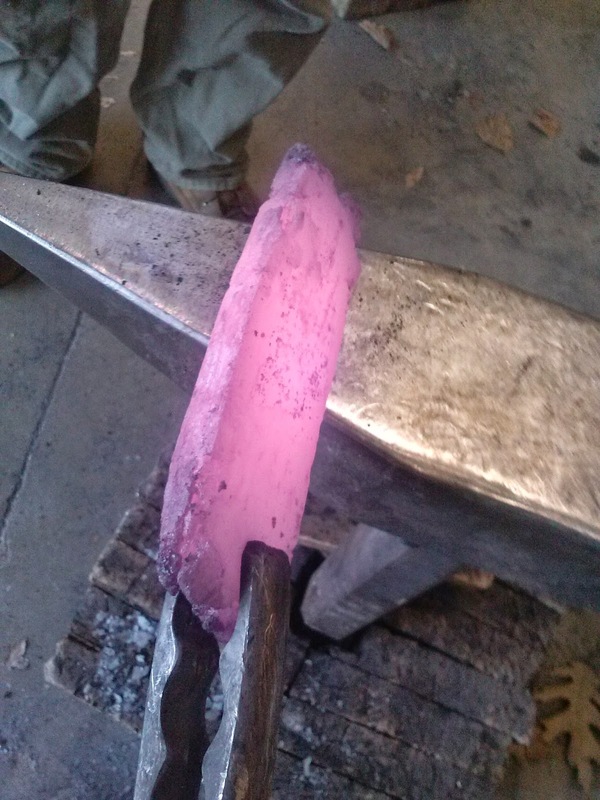 The next day I threw our bar in the propane forge and began to refine it. 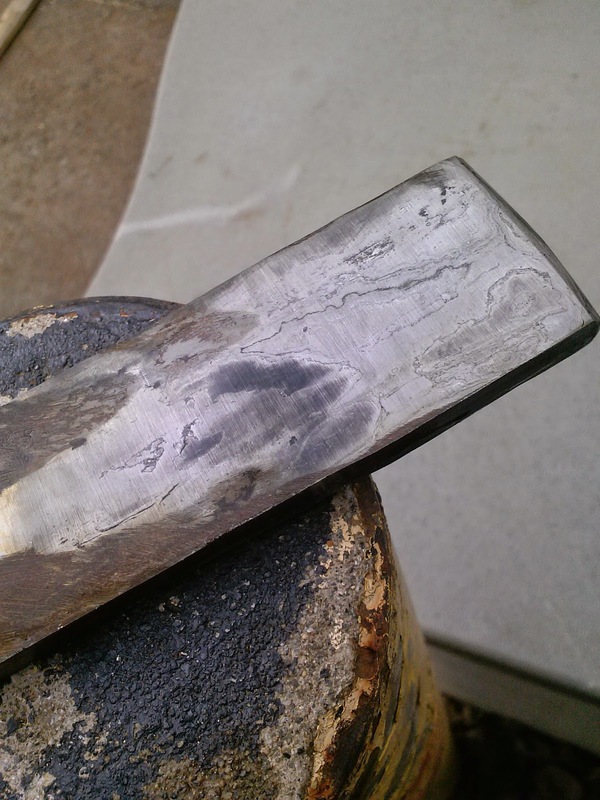 Refining is essentially heating it up to welding heat again, and further solidifying welds and expelling slag by forging the bar out, folding it on itself multiple times, welding the fold seams shut, and drawing the bar out again, kind of like stretching and folding layers of play-doh. 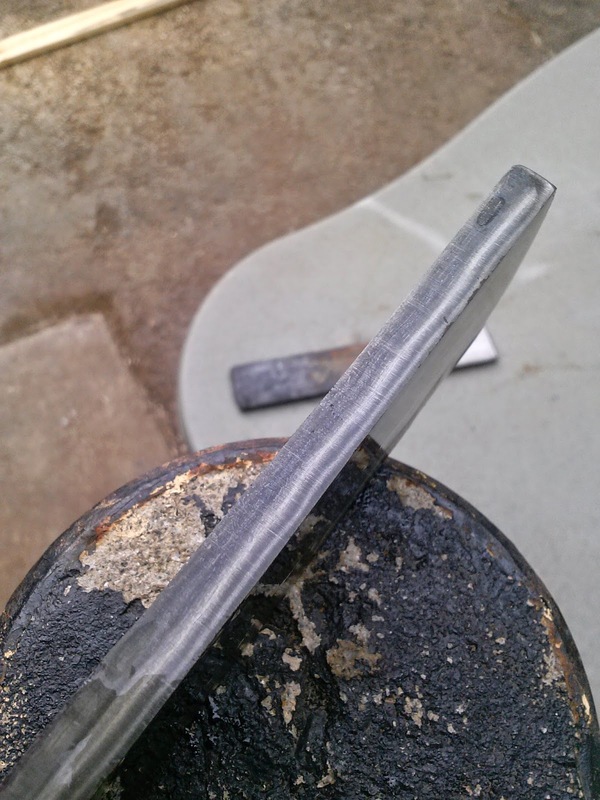 They all seemed to take, though I had a few minor bubble issues, but eventually I had a flat bar with no weld flaws. I can't truly count the number of folds because many of them were half-folds. It still happened though, and once my flaws were gone I let it cool again and put it on the scale. 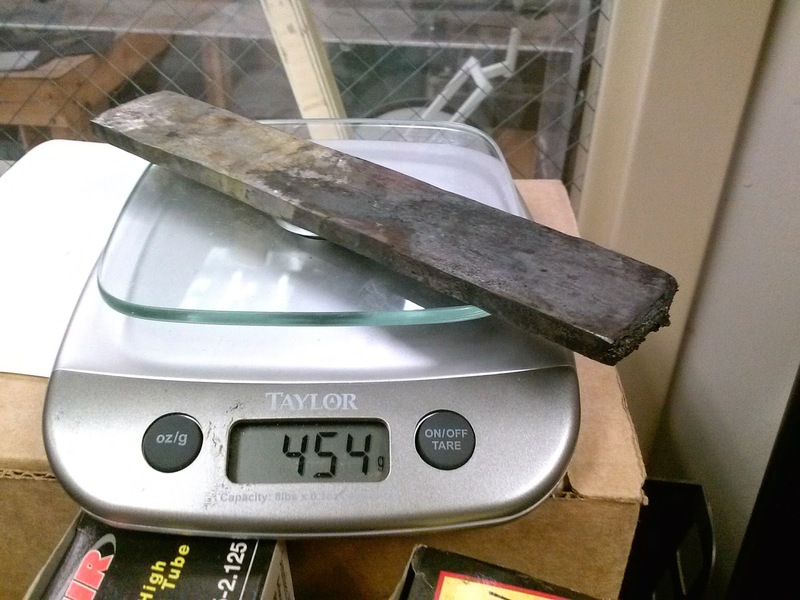 454 grams meant that I had about 69% of the bar that I initially weighed. I wish I'd weighed the material I had before welding any of it together, but I totally didn't. So there. Where did the weight go? I'm guessing there were two main causes of material loss. The first is slag. The slag is mostly composed of various silicates from the solid fuel and the material the furnace is made off. 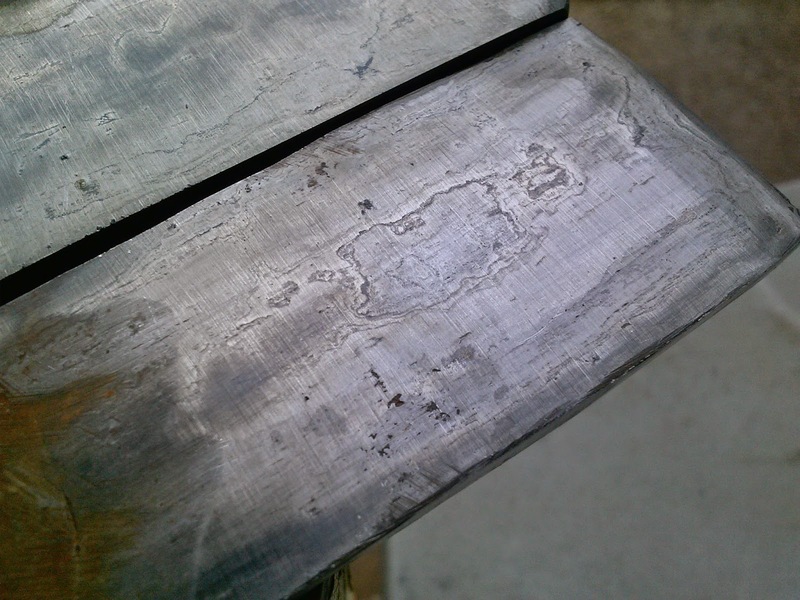 These are rock-like bits that melt while the iron is still solid at high temperatures, and as liquid, they fill up the cracks and get squeezed out when you hammer and fold. The other cause of material loss was probably just oxidation. In such a hot fire, iron converts incredibly quickly into iron oxide (in the form of black scale, a kind of rust), and the amount of welding heats I had to take probably reduced a lot of the material into that. 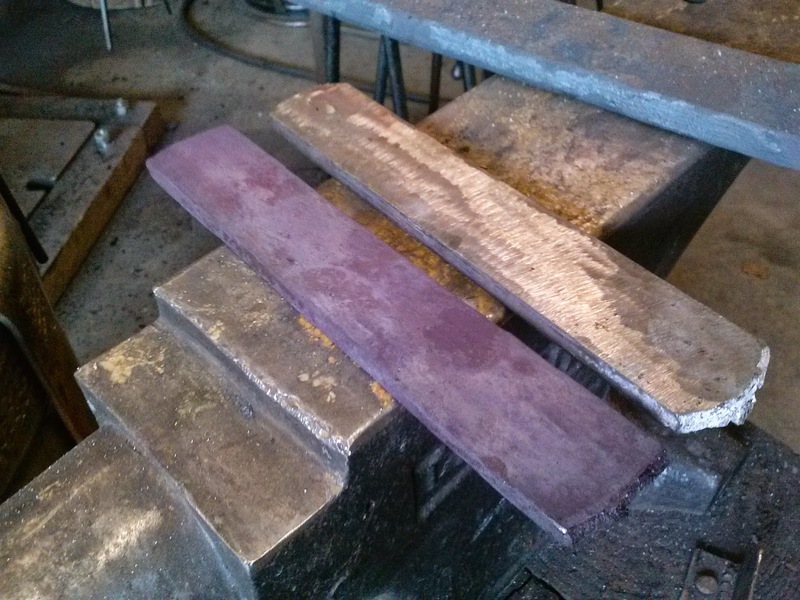 It just so happened that at MassArt last year I consolidated a bar of bloomery iron from when I was in England with Owen Bush. 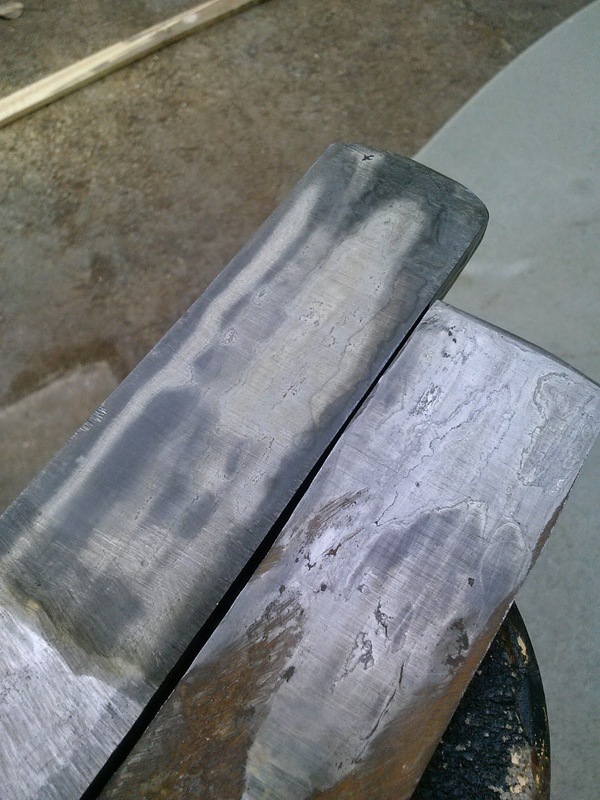 It had almost the same proportions as my new bar (on the right in the above photo), so I decided to polish the two, and etch them to compare their pattern and what little I could tell about refinement/slag content, carbon content, and anything else. The etch was much more revealing that I thought it would be. The left one is Owen's bloom. The right one is the hearth material I made with Jack mixed with Jeff's bloom. Ours has a more complex pattern probably due to more slag and somehow less homogenous material. Ours is also shinier. What that means is that Owen's bloom, with the cloudy, dark parts, has much more carbon in it. Carbon-rich steel etches dark (unless it has nickel or chromium in it, which this does not), and that's just something I know from experience. If I were to pick one of these for a knife or a tool edge, Owen's would clearly be the better choice. But I have to say that from a purely aesthetic perspective, the less homogenous steel has an incredible appeal. Also, though I had a hand in making Owen's bloomery steel, the intimate involvement in the creation of the other one was so fresh in my hands and mind that I couldn't stop looking at it, couldn't stop looking deeper into its random matrix. My favorite thing about this material is that it takes so long to make and is so imperfect that along with the slag and weld lines, it packs memories, conversations, frustration, and cooperation in between the layers. It's a trophy of mutual discovery and a sedimentary painting of process. It's also a little bar-shaped window into the random pattern-storms that only nature can make, full of beautiful tree-diseases and river-paths seen from on high. It exposes the illusion of imposed order, as well as the cooperation of the chaos that is the true nature of order. Awesome article! I admire your ability to perform a solid, clean forge weld like you've displayed in some of your other articles and works. I still struggle with welding, but reading things like this gives me a lot of insight into the hard work and dedication it takes to complete a successful weld. Bravo, sir!